On the way to Wexford yesterday, two of us stopped for a short time in Bunclody, which for generations was home to my branch of the Comerford family. Bunclody is a planned estate town, laid out as Newtownbarry in the second half of the 18th century by the Maxwell-Barry family. The Comerford family was living in Newtownbarry or Bunclody at this time, and as stuccordores and builders they were probably involved building and decorating of many of the fine buildings that line The Mall, Bunclody’s Main Street, and the Market Square. Many generations of the Comerford family lived in the house on The Mall that was the Post Office until it closed within the past six months, and in a house on Ryland Street. The Comerford house on The Mall later passed through marriage to the Lawler family, who once ran the Mall Hotel on these premises. The house was built as one of a pair, and is one of the most important architectural works on The Mall. This is a semi-detached, two-bay three-storey house, built ca1850, incorporating the fabric of a much earlier house. It was later renovated, and the opening on the ground floor was remodelled to accommodate commercial use. The house is one of a pair. 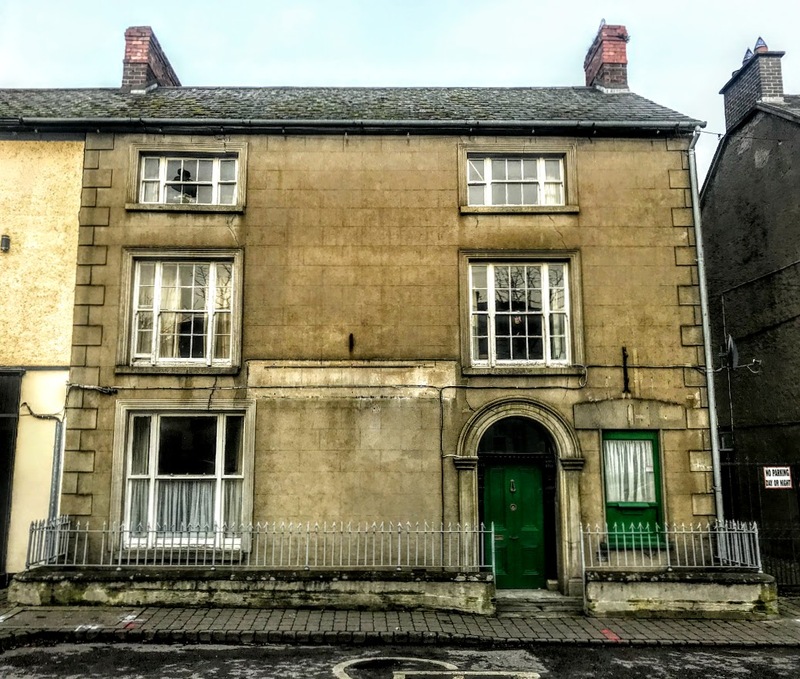 The square-headed window openings are in a tripartite arrangement with cut-stone sills, moulded rendered surrounds, six-over-six (first floor) and three-over-three (top floor) timber sash windows with two-over-two or one-over-one sidelights. There is a one-over-one timber sash window at the ground floor that has one-over-one sidelights and a square-headed opening inserted to the ground floor with a concrete sill, rendered surround, and fixed-pane fitting. The stucco and decorative work of the Comerford family can be seen in the door and the doorcase. The house has a round-headed door opening with a rendered, diamond-pointed panelled pilaster surround that has a moulded necking supporting an archivolt voussure, bull-nose reveals, a timber diamond-pointed panelled pilaster doorcase on padstones, with acanthus-detailed fluted consoles supporting the entablature, and a timber-panelled door with an over-light. The interesting details in the house include the windows that diminish in scale on each floor in the classical manner, producing a graduated visual effect. These windows are inspired by the work of James Wyatt. Until the Post Office closed recently, the house had been well maintained to present an early aspect with the original form and massing surviving in place together with most of the historic fabric, both outside and probably inside. Papers from the Farnham collection at Newtownbarry sold at auction in Dublin 15 years ago  show the first glebe house or rectory in Newtownbarry may have been designed by the stuccodore and master builder Robert West, who submitted his proposals in 1784. The present rectory, built in 1808, has a Morrison doorcase and the openings diminish in scale on each floor in the classical manner producing a graduated visual impression, once again in a the style inspired by Wyatt. West was based in Dublin from about 1752 until he died in 1790. In 1752, he was admitted a freeman of the city as a member of the Plasterers’ Guild. His stucco work in Ireland includes the hall of the house he built as a speculation at No 20 Lower Dominick Street, Dublin, the chapel in the Rotunda Hospital, Belvedere House, Great Denmark Street, and in No. 9 Cavendish Row. His best-known pupil was his friend Michael Stapleton. I was invited by the Lichfield Civic Society last year [24 April 2018] to lecture in Lichfield on the architectural influences of the Wyatt family. James Wyatt (1746-1813) was born at Blackbrook Farmhouse near Weeford, south of Lichfield, into a long line of Staffordshire builders, decorators and architects. His first major building was the Pantheon in Oxford Street, London, which was described by Horace Walpole as ‘the most beautiful edifice in England,’ and he became the most acclaimed and influential architect of his age. If the Comerford brothers learned their skills from a pupil of Wyatt then it is interesting that they went on to work on so many Pugin churches in Ireland, and that my great-grandfather, James Comerford (1817-1902) from Bunclody, took an interest in the history of the Comberford family in the Lichfield and Tamworth area of Staffordshire until his death. In front of the former Comerford family home, the Channel in The Mall in Bunclody was cut ca 1825, incorporating an earlier channel from 1775. It was provided by the Maxwell-Barry family to supply clean water to properties in The Mall through a system of underground ducts. 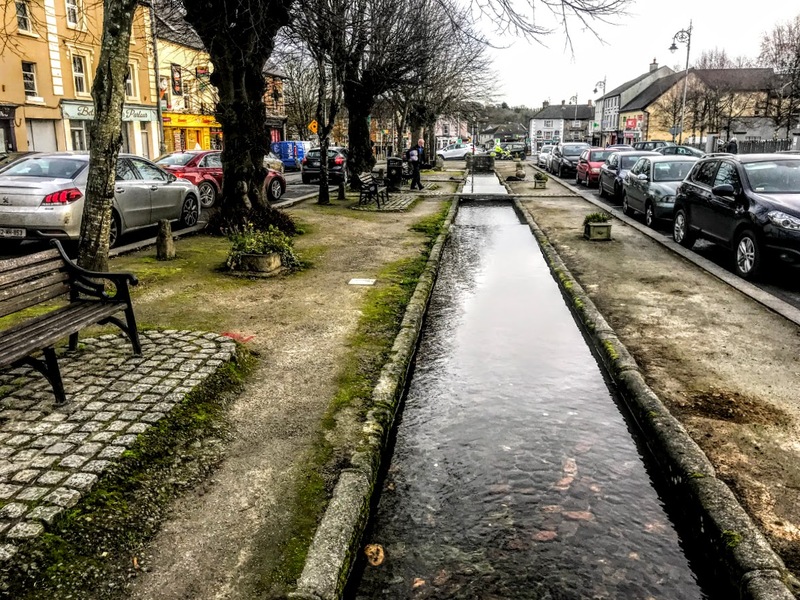 The channel is a familiar landmark in the centre of Bunclody and is part of an early urban landscape initiative. The name of the Mall House, the former Comerford family home, and later the home of the Lawler family is now used by the former barracks, formerly the King’s Arms Hotel, established in the 1700s, although the date displayed today says it was established in 1834. Despite last year’s lecture in Lichfield, I still had to unravel the connections between the Comerford brothers and Robert West and James Wyatt.